Your nails say a lot about who you are, and there are many types of manicures that allow your personality to shine. From your basic manicure to gel polish manicure and everything in between, you can choose one that best expresses who you are today—and tomorrow. If you are a manicure newbie, this type is best to start with because it’s simple and will do the trick to make your nails and hands look and feel their best. Should you have on old polish, it will be removed as a first step. The nails are then buffed and shaped. Luckily, you no longer have to choose between only two nail shapes. The shape possibilities are practically endless, and this is where you can tap into who you really are. Are you daring, simple, conservative, a trendsetter? Whatever your personality at the moment, you can choose from such trending shapes as oval, squoval (square and oval), stiletto, lipstick, and more. After shaping, your nail technician applies a product (cream, lotion or oil) to your cuticles and he or she will then place your hands into a dish of warm water to allow the cuticles to soften and any dirt or grime underneath the nails and within the nail beds to loosen. After soaking for about five minutes, the hands are removed from the water bath and the cuticles are trimmed and underneath the nails are cleaned. With the hands dried by towel, they and the forearms are given a quick massage with oil or lotion before a base coat is applied to the nails, followed by two coats of your choice of polish. Lastly, a top coat is applied to seal and lock in the polish. To dry the polish, the nails are typically placed under a UV nail dryer that is equipped with a timer. The French manicure begins just like the basic manicure, except this manicure is clearly defined by its dual colors. Traditional and clean, a clear, pale pink or beige polish is applied over each nail and allowed to dry. Then, very carefully, a white polish is placed along the tip, either straight across or with a slight bend in the center (giving the look of a quarter moon). This works for those with or without artificial nails, and with all nail shapes and lengths. A reverse French follows the same process as the French manicure, but it is exactly as you would imagine: in reverse. Another distinction is the color of the polish used. Traditionally a French manicure calls for a clear, pale pink or beige polish as the base, with a white polish to accent the tips. With the reverse French manicure, however, the base that is applied over the entirety of the nail can be any color you choose, as can the accent polish, which, in this case, is placed along the nail bed—also either going straight across or in the shape of a quarter moon. Again, your gel polish manicure will start off like a basic manicure. However, what sets this manicure apart is the polish application. Gel polish is as it sounds: it is a gel in the form of a polish that comes in a variety of colors. After a base coat, the gel polish is applied to the nails, followed by a top coat. The client’s hands are then placed under a UV light, which allows the polish to dry and harden. Because of the polish’s consistency, it adheres to the nail better than regular polish (making it less prone to chipping) and its luster lasts for weeks. Note that a gel polish manicure is not to be mistaken for a Gel manicure. What many call a Gel manicure is in fact a shellac. When people request a Gel manicure, what they actually want is UV-cured polish without artificial tips. What is a silk wrap? You may have pondered this question before if you’ve heard term around the nail salon. Just as any manicure starts with a proper cleaning of the nails and cuticle maintenance, so does the silk wrap. But instead of filing the nails down with a buffer, the nails are sanded down with a rotary drill. This particular sanding process allows the silk to adhere to the nails. With this specific manicure, you can add small artificial tips to your nails. This is great for someone whose nails are uneven or if they are short and you desire length. In the event tips are added, they will be glued to your nails, then trimmed down to the length you choose. The nails are sanded once more to create a smooth, seamless transition between your nail and the artificial tips. Having a smooth base also helps to ensure proper application of the silk. First, however, the nail technician places a special primer over the entirety of the nails. Then, the silk wraps—either made of silk, linen, mess or other fabric—are prepared for application. They come pre-cut and the technician will trim the silk to fit the shape of the nail; the length often is not tampered with. Two layers of the fabric are applied to the nail with special nail glue. Any excess is trimmed away, until they reach the proper length of the nails. Once again, they are sanded and buffed, making them ready for the remainder of the manicure, which follows the same steps of the basic manicure. An American manicure mimics the French manicure, but is an updated, yet more subtle version. How it differs is mainly in color. The French, as we noted, consists of a clear, pale pink or beige base and often stark white tips. The American, on the other hand, calls for a base that is light and practically skin-toned; the tips are a faint white or creamy color, which, when said and done, gives it a blended, more natural appearance. Though the two colors blend into one another almost seamlessly, the tip is still defined like that of a French manicure. 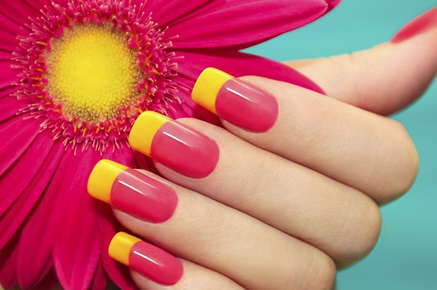 Gel and acrylic are both manicures that can extend nail length by use of artificial nail tips. They are different than a shellac or gel polish manicure as the latter does not add length. Not all salons offer Gels, but most offer acrylics. Acrylic manicures are normally performed by removing the cuticles and applying an acrylic power or liquid. This occurs before the artificial acrylic nails are attached. As a result, the artificial nails harden, causing them to be fortified and able to stand up to the activity and abuse our hands/nails take every day. As the weeks pass, your nails will grow out. This will cause a separation between the “new” nails and the artificial ones. Rather than starting from scratch, at least initially, your technician can fill in the growth gap using more acrylic power or liquid. Gel manicures can be done with or without the application of artificial fingernails. The natural nail is shaped and the cuticle pushed back, after which several layers are applied to the nail in preparation for an artificial nail or just a polishing. Application of each layer is followed with curing under a UV machine. So, which is best for you? This really comes down to preference. Gel nails are typically more natural looking than acrylic nails, but they are not as durable. As to how long your manicure will last, this varies depending on the type of manicure you received and how much you use your hands/nails to perform tasks. Your nail health is also a determining factor. If you nails are normally brittle and weak, and if you do not have artificial nails, you could be looking at a week or less. The same, however, is true of those with healthy, strong nails—not because the nails are prone to breaking and tearing, thus ruining the shape and look of the manicure, but because the polish will begin to dull after a few days and perhaps even chip. That said, if your shape is still intact and your nails are seemingly in order, you can do a quick polish change yourself or, to get the perfect application, you can visit your nail technician, who will charge you a nominal fee for this service. Gel polish manicures, on the other hand, can last for weeks, appearing just as shiny on day 14 as they did on day one. As for silk wraps, the nails are made very hard and strong in the process, but after about a week the polish may start to chip. In some cases, the fake nail tips may become unglued. With this particular manicure, you will require more frequent polish changes, for the bare nails appear a pale yellow or textured due to the wraps, which can be unpleasant to the eye when unpainted.